We got an incredible view of flying macaws, from a cliff-top above their nesting site. There are so very many bitey stingy things in the jungle, but it was the ants that really messed with my head. You just can’t see those bastards coming. Right, well that’s good then. “Not as bad as the bullet ants, though,” he pointed out a short while later, gesturing towards an enormous ant on a tree trunk. “They give THE most painful bite. The pain travels to the nearest set of glands and constantly hurts like hell for 24 hours. Remember that woman we had who got bitten and was screaming her head off?” he said to fellow guide/cook David. 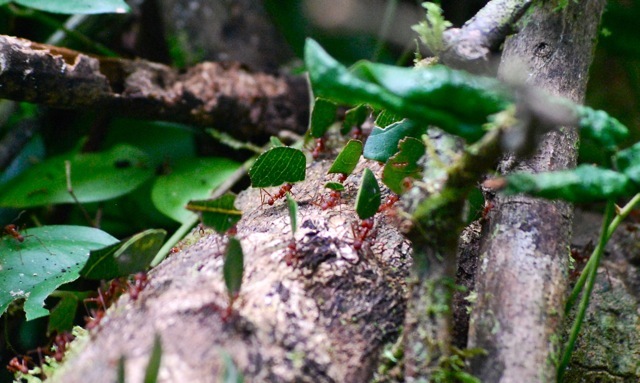 Leafcutter ants, we like you, you’re nice. Why is it called a bullet ant? I’ve since Googled it, and the pain – said to be officially the most ouchy insect bite in the world – is often compared to that of being shot. Great. So how are we all enjoying our trip to the Bolivian jungle? Shortly after arriving back in La Paz we decided to do a little detour up to the country’s Amazon region and take a trip into Madidi National Park for a bit of wildlife-spotting and jungle hiking. We didn’t have time to take the van on what is a phenomenally bad, and often closed, road because Jeremy had to be back in a week to fly to England. 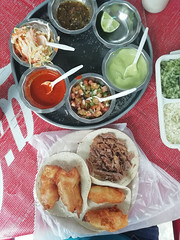 So we did something that in his past life he would not have considered, at least not without taking a bucketload of tranquilizers first – we took a 16-seater plane that flew so low it barely skirted over the Andes, and then descended into the jungle at Rurrenabaque. Even I was feeling uncomfortable about our proximity to the pilot, especially when he and his co-pilot started digging around for what looked like a ‘user’s guide to aeroplane engines’ and began studying it intensely during take-off. It was mighty strange to leave the heights of La Paz and 30 minutes later be looking down on the meandering brown rivers and forest of the Amazon basin. A rather close-up view of the Andes from our plane from the Bolivian jungle to La Paz. Jeremy looks very happy to have arrived safely in Rurrenabaque in a 16-seater plane. View of La Paz from our plane back from the Bolivian jungle. We set off the next morning on a three-night trip that involved going upriver for a few hours then spending one night in a community lodge, and two nights hiking and camping on the ground under a mosquito net. The great thing about proper jungle is that you really have to work for your rewards. As much as we have loved places like Costa Rica – where habituated animals practically do a dance for you on the trails – it doesn’t compare with running and leaping through virtually unspoiled forest to try to catch up with a herd of peccaries that our guide can smell in the distance, or spending forever looking up into the canopy tops and finally, just before one’s neck can stand no more, catching sight of a toucan or the face of a spider monkey. Some species stayed elusive, like the shy tapir. We studied their footprints, as well as those of jaguars, but never met them on the trail. Over this trip we have been very lucky to see hundreds of monkeys, of many different types, but in Bolivia we were excited that as well as spider, squirrel, howler and capuchin monkeys, we saw two species that we’d never even heard of. A whole troupe of tiny Lion monkeys careered across our path at one stage, giving us a very privileged close-up. And one night, in a tree right above our camp, we saw a nocturnal monkey who, unperturbed by the flashlight, stared right at us for several minutes. Lion monkey, Madidi National Park, Bolivian jungle. Nocturnal monkey, see during a night walk in Madidi National Park, Bolivia jungle. 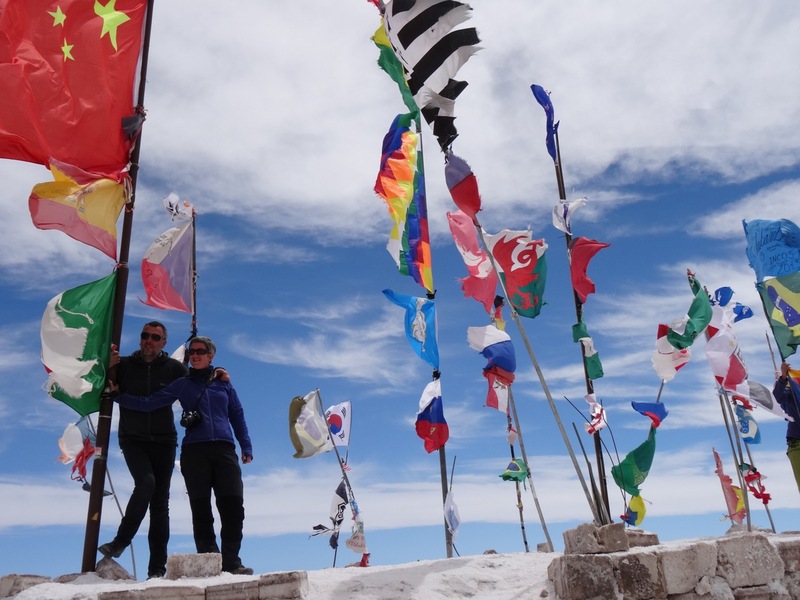 When I say ‘we’ saw this or ‘we’ saw that, it’s worth mentioning that without our amazing guides we would have seen big fat zilch. These guys literally live the jungle and have the most incredible sense of hearing, sight, smell and direction. We hear a distant chirp that sounds like ‘a bird’ and they identify it as a particular type of monkey. They can mimic the calls of most birds and mammals, and often elicited responses during our walks. On the night we saw the nocturnal monkey, we were sitting back at camp after a night hike. Two tree frogs very nearby were making such a commotion it sounded like two men were trying to fell the tree with a two-handled saw. We remarked that if that continued all night there was no way we’d be able to sleep. Suddenly our guide stands up, ear cocked, and says he has heard the chirrup of a nocturnal monkey. He takes the flashlight and immediately shines it upwards into exactly the right spot in the canopy. Two little eyes flashed back at us from about 30ft above. How the hell….?! Each evening involved a hike in the pitch black. The first night – when we were based at a lodge – we were looking forward to our first foray into the night forest. “We’re looking for snakes and spiders”, said Eber, who started rooting around very close to our wooden cabin. “Hang on, surely we have to go really deep into the forest, away from where we’re sleeping, to find those things….” we said. “Nope” said Eber. And so it was that we not only found a huge furry tarantula hanging out on a tree a few feet from our cabin, but when we retired to bed, another one was literally hanging out on the thatch outside our bedroom. “I’ll never sleep now,” said Jeremy, a couple of nanoseconds before falling into a deep eight-hour slumber. 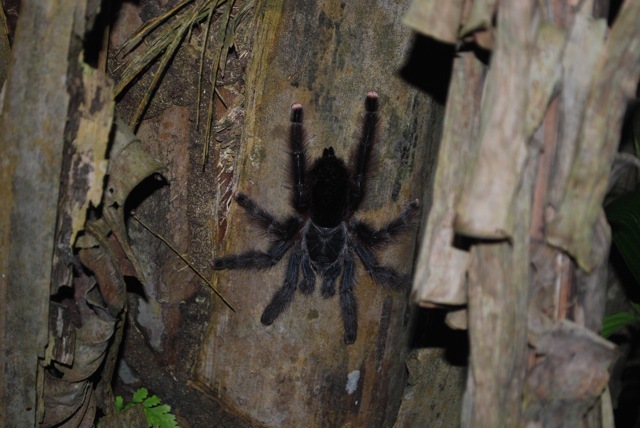 Tarantula seen during a night walk, Madidi National Park, Bolivian jungle. Our other two nights of sleep were slightly less luxurious. Basically a plastic sheet on the ground with a net hung over it. 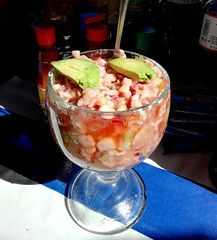 Not very ant/spider/jaguar-proof…. We spent a lot of time looking at, and looking for, birds – seeing toucans, mot-mots, eagles, parrots, trogons, woodpeckers, and countless other things that we can’t remember the names of. One very special moment was coming across the most beautiful owl as we returned from a night hike. It was right in our path, and watched us for several minutes as if it couldn’t quite work out what the hell we were doing there. We were intensely concentrating on a bird above us one day when I felt something tickle my hand. I looked down. Bullet ant. Heading for the gap under my sleeve. No-o-o-o-o. The velocity with which I flicked my hand was such that I was surprised to find it hadn’t dislocated and flown off into the trees. I spent the next hour shivering at the thought and brushing imaginary ants off my skin. But the incredible things we saw massively compensated for the relative discomfort and creepy crawly fears. One of the biggest highlights was climbing to a rather steep and scary cliff-top to get a birds-eye (see what I did there?) 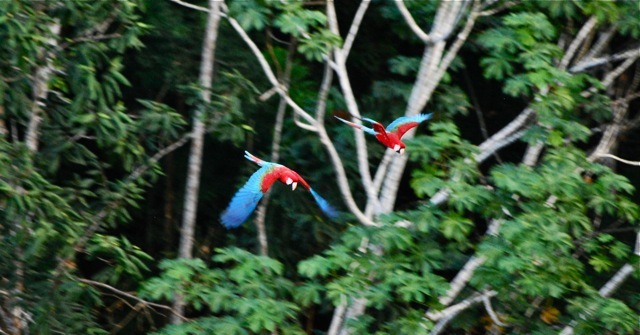 view of scores of red and green macaws swooping around the trees next to their rocky nesting sites. You could watch these parrots all day, it’s like they’ve been created for some ridiculously over-the-top movie about a lost paradise world. The next morning we walked to the bottom of the cliff to watch them at their nests from below. Very special. Macaws moving in unison, Madidi National Park, Bolivian jungle. The jungle is no paradise for your average amateur photographer though. Zooming up into the sun-backed canopy, shooting into dark corners, and trying to capture fast-moving birds and monkeys – it’s good fun trying but basically a nightmare! We tried our best to capture some of those moments, but really you have to see it to believe it. Things we now know to be true: It’s a jungle out there. Turtles seen during the river journey to our jungle trip, Bolivia. All hands on deck to press the sugar cane, jungle trip, Bolivia. Delicious drink of freshly-squeezed sugar cane juice with lemon – trip to Bolivian jungle. Caiman lurking by the river as we travelled to our jungle trip from Rurrenabaque, Bolivia. Howler monkey, Madidi National Park, Bolivian jungle. Boat transport, Madidi National Park, Bolivian jungle. Capybaras, Madidi National Park, Bolivian jungle. Sunset, Madidi National Park, Bolivian jungle. 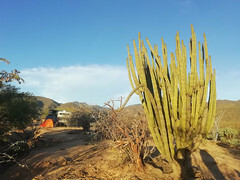 Setting up camp on night one of our Bolivian jungle trip – here’s the kitchen! On day one of our Bolivian jungle trip cook David gets to work on the lunch. Is this to keep the bugs out or keep me in? Trying out our rustic sleeping arrangements, Bolivian jungle. Mating butterflies, Madidi National Park, Bolivian jungle. Macaws returning to their cliff nests, Madidi National Park, Bolivian jungle. 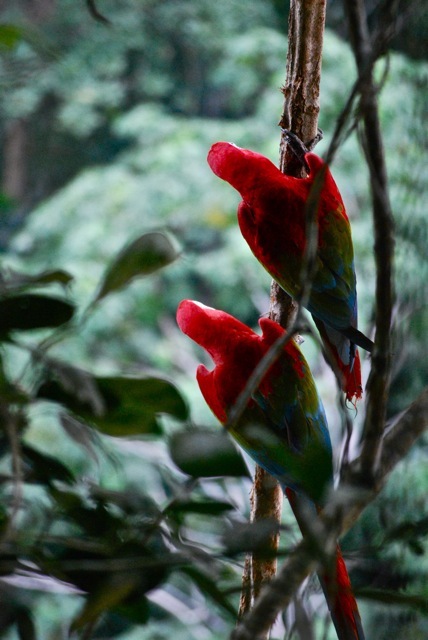 Macaws in their cliff nests, Madidi National Park, Bolivian jungle. Jeremy enjoys some hammock R&R after our three-day lodge/camping jungle trip. Heading back to Rurrenabaque from the jungle lodge. Heading back to Rurrenabaque after our jungle camping trip. Amazing glittery butterfly, Madidi National Park, Bolivian jungle.